Slovenia is located in the very heart of Europe, where the Alps meet the Mediterranean and the Pannonian Plain meets the Karst. Its most-visited areas include Bled, Bohinj, Ljubljana, Maribor, the Soca Valley and Kranjska Gora. In Slovenia, almost every town has a castle; many of them are open to the public as museums and some can even be rented for weddings. Slovenia has it all in one place: a clean, safe coast, verdant countryside, snow-capped mountains and shimmering lakes, as well as pretty rural villages and lively modern towns. Slovenia’s Adriatic coastline may be short, but it has plenty of attractions in its historic Venetian towns and vibrant resorts. It is bordered by Italy to the west, Austria to the north, Hungary to the northeast and Croatia to the south. Slovenia and Croatia shares 670 km (420 mi) of common border. Croatia, which is also a Central European and Mediterranean country, has an amazing 5,835 km of coastline, 4,057 km of which are islands, cliffs and reefs. There are 1,185 islands in the Adriatic, but only about 50 are populated. The largest island is Krk (near Rijeka) which has a land area of 462 square km. Other well-known islands include Hvar, Brac, Korcula and Pag. Both countries have a lot in common: medieval architecture, tranquil lakes and local villages. While visiting this region, one can enjoy the Croatian charm of Dubrovnik and the pearls of the stunning Dalmatian coast, as well as delightful Slovenian destinations such as Lake Bled and Ljubljana. The majority of people live in towns and cities, but a significant number live in the countryside. Agriculture accounts for only a small proportion of the workforce, while the majority of Slovenians work in services and manufacturing. Real estate in Slovenia is currently in high demand. 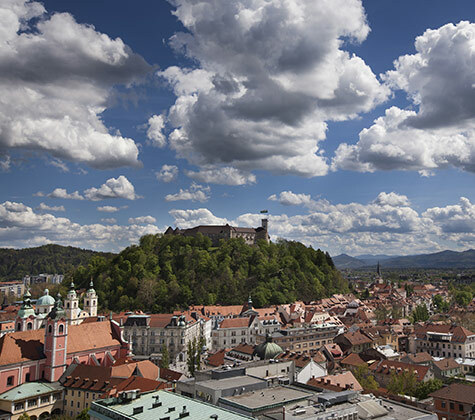 Ljubljana, the capital of Slovenia, offers excellent prices, beautiful apartments,both old and new as well as villas with easy access to the Ljubljana Airport, and other airports in Austria, Italy and Croatia. If you are looking for a second home or an investment property with capital gains, a rental income or a combination of both, the Slovenian real estate market has much to offer you. Visit us and discover the very best of Slovenia, the green heart of Europe, and Croatia, the Mediterranean at its most authentic. Visit cities with special charm like Ljubljana and Dubrovnik; enjoy the purely Mediterranean atmosphere of cities such as Zagreb, Zadar and Split; and explore breathtaking landscapes such as Lake Bled, the Triglav and Plitvice National Parks.